Here’s something you don’t know about me. I like to take pics. Not of me but of other stuff. Truth be told, there was a time in my life that I was rather focused on photography. Even took some classes. I wasn’t great but I wasn’t bad either. Which was fine by me. I liked it way better than my pottery class (obvs I was going through some sort of artistic phase at the time) mostly because it didn’t get my hands mucky. Not to mention, I’m not afraid of the dark so it seemed like a good choice. You see in those days cameras actually had film in them and pictures needed to be developed in dark places. Which is what I did. At least until I didn’t. Because unlike this blog of mine, that hobby had a rather short shelf life. You know, back then cameras, lenses and the associated paraphernalia were pretty heavy and unlike today, didn’t actually fit in a pocket. So it was all a bit of an ordeal really. Here’ something else you might not know about me. I haven’t always lived “out west” (as we like to call it), hailing originally from what some people refer to as “the East” but what most of us know is really the central portion of the country. It’s true. I am a product of the biggest city in this nation which doesn’t really need a mention right now since it has had so many mentions of late and mine would probably just fall through some sort of crack. At any rate, the reason I tell you this is because, when you grow up in a big city you become accustomed to a particular way of life, one that includes concrete sidewalks filled with hoards of people who, at the end of each work day descend from their glass encrusted, high rises (each one taller than the next) to their underground transportation tunnels for the crushing ride home. This is not the land of wide open spaces which might help to explain my fascination with the mountains and the sea. More importantly, it explains why I was so taken with the cows I encountered on an elementary school field trip to a farm, that I brought home, in my little polaroid, a heap of close-ups of their cute little faces. No pictures of my friends or my teachers or even the farmers. Just the cows. Which, I might add, my parents had to pay to get developed. But let me continue. It shouldn’t surprise you that when I found myself living virtually in the foothills (we delude ourselves just a little in the place I now call home) of the majestic Rocky Mountains, I was drawn in by all of the splendour and majesty of those big rocks, not to mention the four-legged inhabitants therein. Now in case you have never had a chance to do so, here’s what happens when you drive through one of our National Mountain Parks. The first thing is all the cars in front of you are going to slow down in part because the speed limit tells them too but also because everyone knows that when you drive through the park you’re going to see animals. If you’re really, really lucky you’ll catch a glimpse of a mountain goat or maybe a moose. If it’s the right time of day and the berries are abundant, you might notice a bear lumbering in the bushes beside the road. But dimes to dollars, no matter the weather, time of day, or cycles of the moon, at some point along the way you are going to run into (hopefully not literally) a flock of mountain sheep. When you do, all those slow moving cars in front of you are going to pull over and stop. Almost simultaneously each and every one of them is going to take a camera out of their pocket and start to snap away because that’s what you do when you see wildlife in their natural habitat. At least that’s what I did each and every time I went to the mountains. The result being a photo album full of pictures of mountain sheep, all looking the same because the reality is, they just do. So really, if you can get one good pic of one of them you can set your camera down and call it a day. Which brings me to my most recent visit to the beach. It’s a funny thing what a little time will do. Of late I’ve had a hankering to resurrect my interest in photography, so much so that I bought myself a nifty little number that lets me take close up shots without the bother of changing lenses. So I’m walking along the beach and look out just in time to see a herd of dolphins (it’s correct and fits with the theme but you can look it up if you like) frolicking in the water. Admittedly, even with my zoom it’s a little harder to catch a pic of these guys, mostly because they are jumping up and down in the water and not standing at the car window hoping for a carrot. 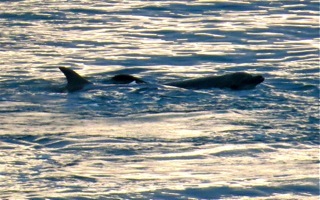 So mostly, as you snap away, you’re going to get pics of the water where the dolphins “were”. But if you persist you will get them, over and over again. Which is what I did. But as I download my shots onto the computer, it suddenly hits me. These are the mountain sheep of the sea. And no matter how many pics I take they’re all going to look the same. Because they’re dolphins and they just do.You’d think I would have learned. Well, at least these days I don’t have to pay for the processing. Never mind the “Ocean Sheep”…takes some pictures of the beach, cliffs, Starbuck’s, your pool…….we are freezing here and need to see pictures of warmer places. I can do that but I’ll have to run outside and get some of those. Not sure it’s going to make you feel any warmer though.